It has been a few months since we fully moved into Jibun Techo Biz 2018. 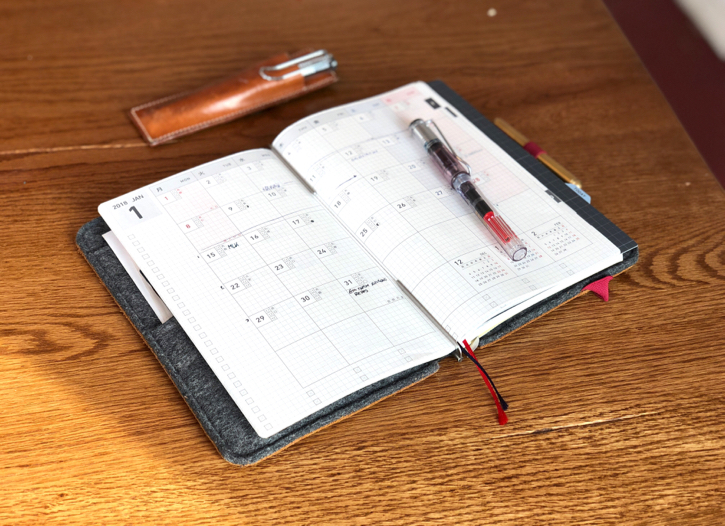 Frido has been using the Jibun with A5 Slim Roterfaden (Light Brown) and I have been loving The Superior Labor Jibun Techo Cover. I feel like we are still figuring out how to make the most of this system but I thought it would be fun to do a side-by-side comparison between Roterfaden cover vs. TSL cover. Frido currently is loving his Roterfaden A5 Slim cover and is totally maximizing what the cover can hold up to! His Roterfaden front pocket holds a lot of miscellaneous artifacts like Field Notes, BK Dashboards, extra stickers, etc. 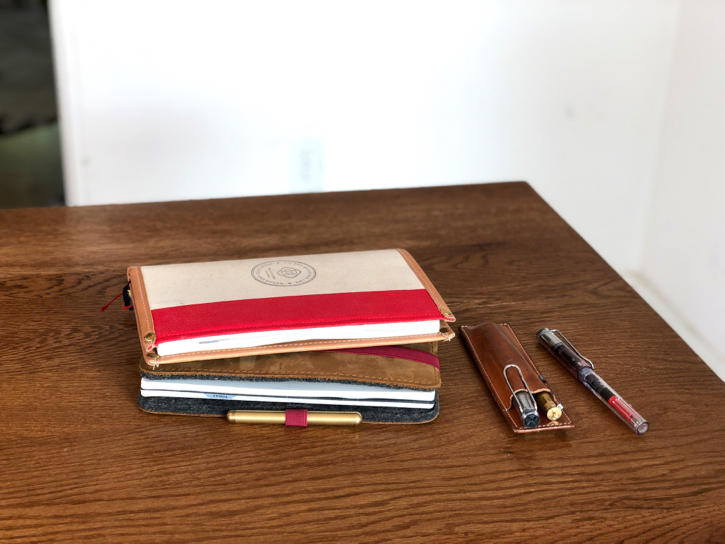 Also having a sewn-in pen loop makes sure that he always has at least one pen to write with. He is holding Jibun Techo Biz and Idea Notebook with two of the Roterfaden clips! It's so convenient when these clips work as bookmarks so he can get to the page he is looking for right away. I think the only downfall of the Roterfaden cover is its thickness. Because of the layered materials they use to construct the cover, his setup is almost twice as thick as mine with The Superior Labor cover. TSL Jibun Techo Cover is more minimalistic in what it does. 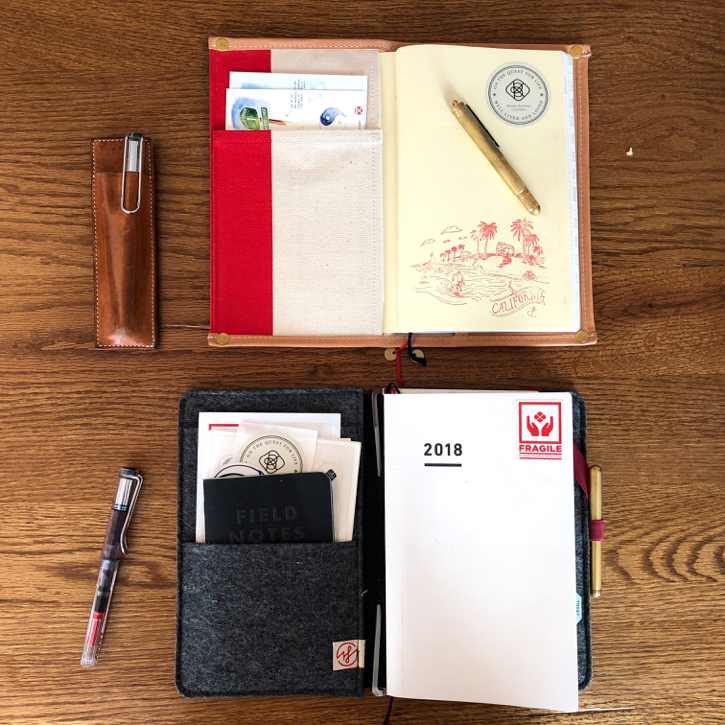 We designed the cover so it can accommodate one Jibun Techo with 2 additional notebooks. I currently carry Jibun Techo Biz, clear zipper case, and additional Idea Notebook. I have a few postcards in the front pocket and a few BK shop card in the back card pocket and just transformed my wallet into the clear zipper case. I wanted to keep my setup as slim as possible so it doesn't become a burden to carry it every day and so far it has been working out. I have a few of my favorite fountain pens in the Pen Holder Clip and I am ready to go. 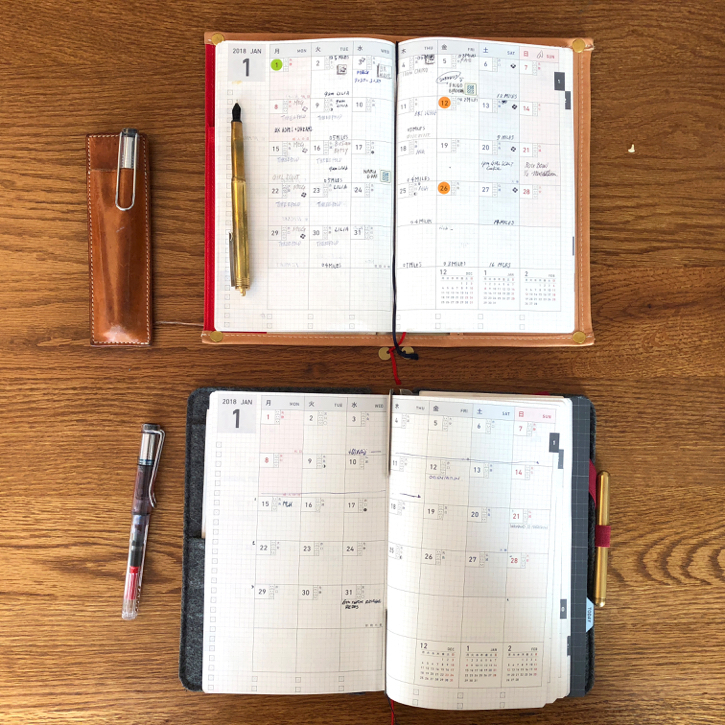 To continuously design the set up that works for my unique needs of the moment has always been the driving force to change and I am excited to explore different ways to utilize the Jibun Techo in 2018! Have you set up your 2018 analogue system?? What are you doing differently this year? Would the Roterfaden be slimmer if the material was leather for the exterior and suede for the interior? Is it the felt material that makes it bulky? Is it just bulky in size or does it also add to the weight? For the Jibun Techo Biz, does it lay flat? 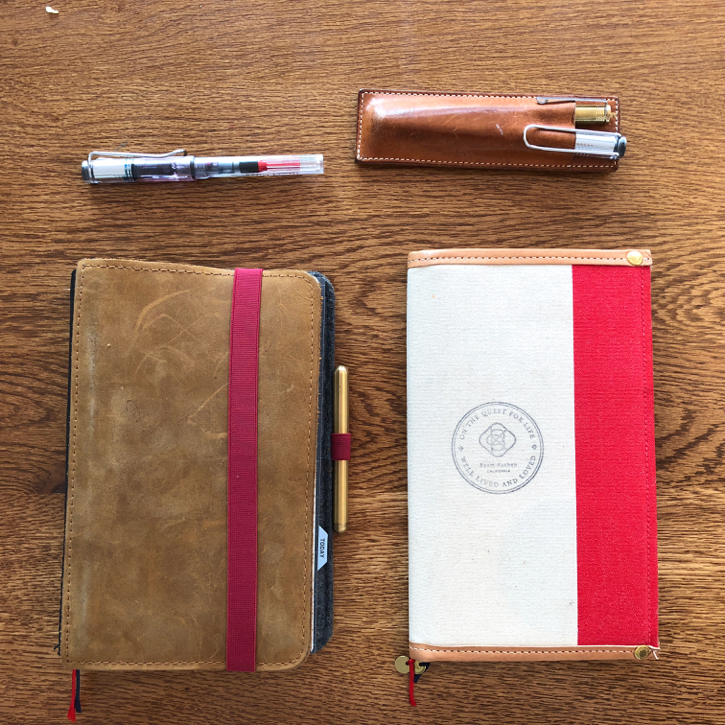 My sometimes challenge with a Traveller’s Notebook Weekly is that I have to keep holding down both sides of the notebook when writing. 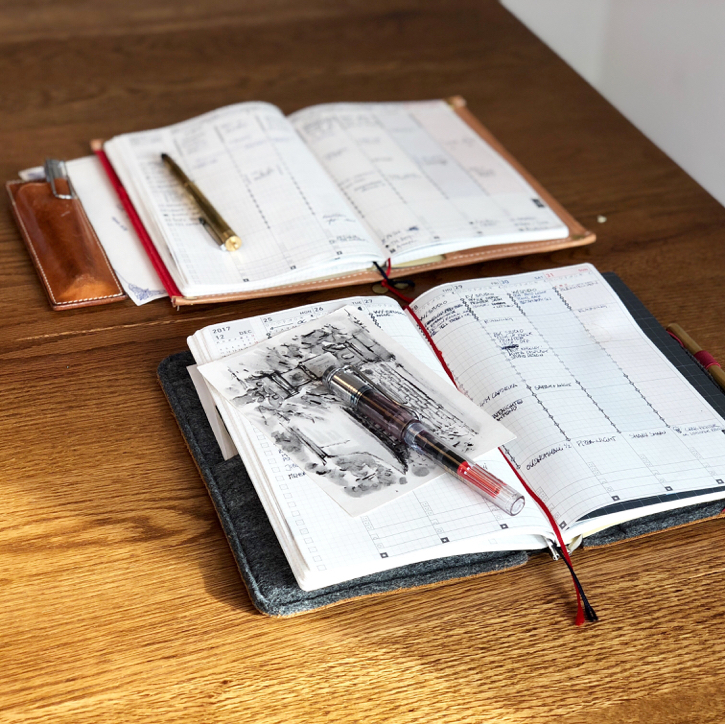 It’s always an exciting time when planning for the next year’s planner setup and your shared experiences and inputs here are highly appreciated! 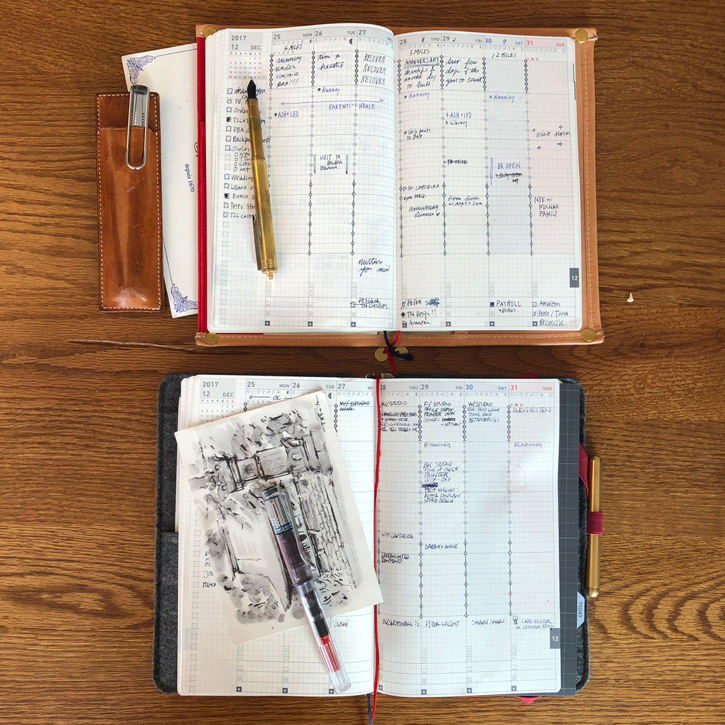 Can you show photos of all 3 notebooks in your Superior Labor Techo Cover and how they are placed inside? I have the black one coming and am excited to use it!